Once agin the Metro hot air bubble protected us from the worst of the storm as you can see from the photos below. John, my gardener checked in and cleaned our driveway, so now I can get to the dentist. Hooray! I had to steal David’s dental hygienist because I am having some gum issues. We will reschedule David later this morning at the office. My hygienist had car trouble and has three little kids at home so she could not make it into the office, proving once again youngsters these days must cope with many things. I saw the White-breasted Nuthatch who lives in the Walnut tree or visits daily. Mrs. Cardinal was at her favorite feeder, the Juncos were chasing each other, and the Hairy Woodpecker was here to bang his beak on my porch. God’s in his heaven and all’s right with the world. Johnny loves the snow. 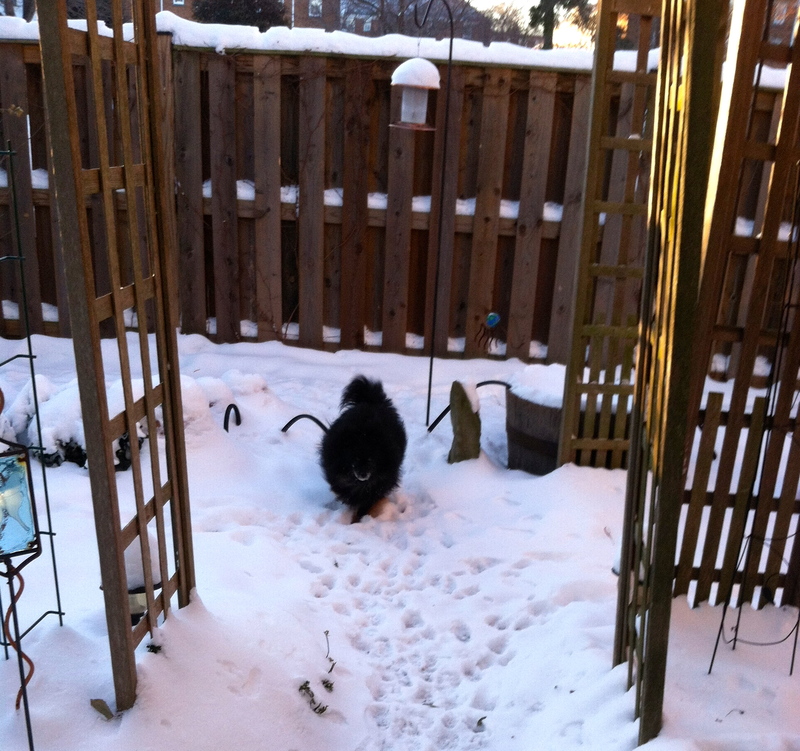 That’s his ancestral genes at work as Poms were bred from sled dogs. 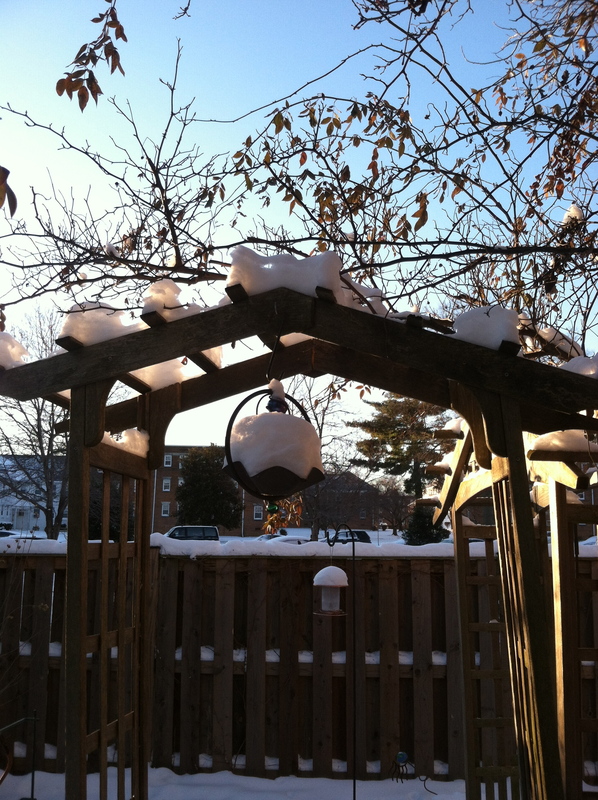 Cold, but the sun is out and the heated bird bath works!! This entry was posted in Birds, Elder Blogger, Environment and Nature, Photography, Retirement Living, Urban Spaces by SchmidleysScribblins. Bookmark the permalink. Like that heated birdbath. Your list of feathered visitors makes me envious. 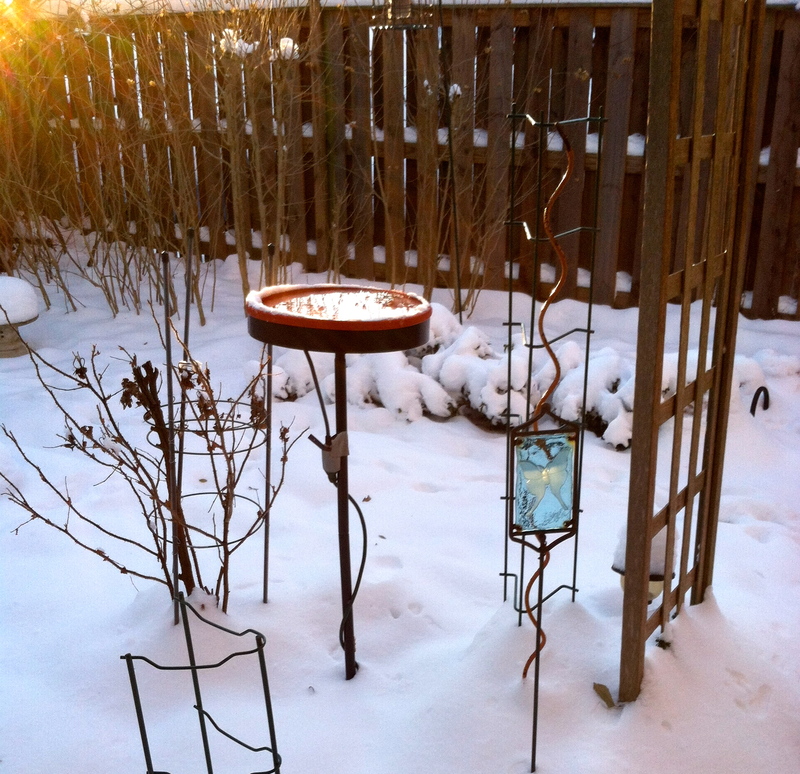 We have been enjoying our usual goldfinches, titmouse, chickadees, cardinals and occasional jays. Those birds of yours show up here too. Also Carolina Wrens, doves and other odd birds..many sparrows. I didn’t know that about poms! Can’t help but picture a little tiny sled ))))! Good for you for keeping your dental appt when you had so many excuses to cancel! Good for me in more ways than one!! Poms may be small but they are strong. I think they could pull a big sled. Hmmm… I haven’t gotten the weather report from my daughter in Chicago or son in D.C. They must be too frozen to write me. They’re having a tough time up north. 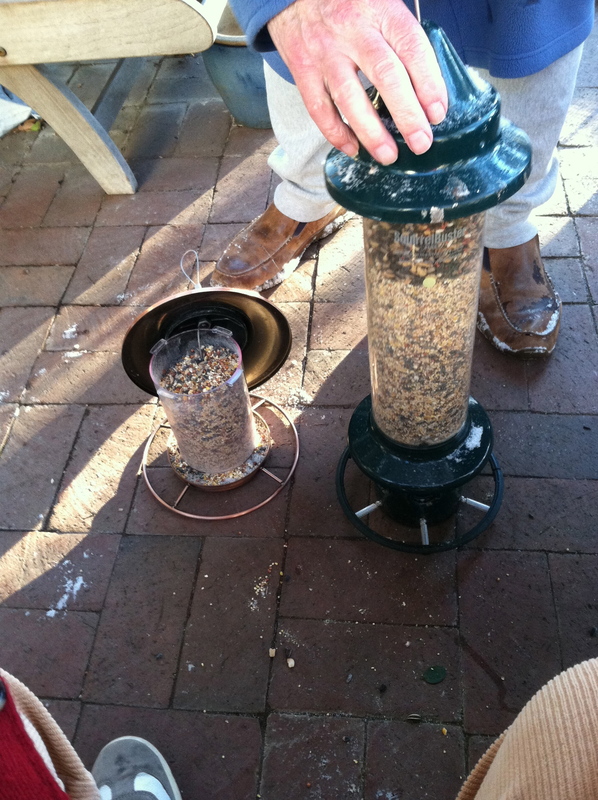 I’m sure the birds are grateful for the seed. Interesting that you posted a photo of the heated birdbath — I’ve been wondering what it looked like. I’m thinking it must feel like a hot tub from the bird’s point of view. Or do they just drink from it? Temperature in the heated birdbath is 40 degrees. Warmer than the air. Birds like cold water, but not frozen water.